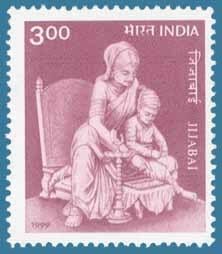 Jijabai (1598 – 1674) was the mother of Shivaji, one of the most famous and successful Hindu rulers of all time. The life story of Jijabai, is no less inspiring than that of Shivaji, and takes an equally proud place in the history of the Hindu people. Jijabai’s father, Lakhuji Jadhav Rao, was a leader serving under the Muslim Nizamshahi administration. During those days, many Hindu chieftains of that region were serving under the Nizam. They had small armies of their own and had obtained lands, money and status. These Hindu chieftains were always vying to outdo each other; trying to increase their power and prestige at each other’s expense [parallels with today???]. It was Holi, and Jijabai’s father threw a large celebration. Jijabai, still a young child, threw coloured water over a boy named Shahji, who in turn did the same back to her. Jijabai’s father liked the boy. Drawing the two children towards him, he jokingly exclaimed, “Don’t you think these two make a great couple?” Everybody agreed. But this is not what Jijabai’s father had in mind! He was just making a light-hearted remark, and considered himself too high to seriously think of marrying his daughter to the son of an inferior ranked man like Maloji. Jadhav Rao harshly rebuked Maloji’s presumptuousness, causing Maloji to leave the hall feeling embarrassed and angered at the public spectacle. Maloji never forgot the shame he felt that day. He left his military post, and returned to his ancestral village. For a while he went back to tilling the fields, and was very depressed. But his fortunes were soon to improve. One night, it is said that Maloji had a strange dream. The Goddess Bhavani appeared before him in dazzling splendour and advised him not to sulk, but to strive hard in life, as a hero and harbinger of a new era was soon to be born in his family. The next day in the field, late at night, he once again felt the presence of Bhavani, who advised him to dig at a certain spot. He did so and unearthed 7 pots of treasure. While the verity of this account is questionable, what is beyond dispute is that Maloji’s acquisition of this wealth was to have a profound impact upon the future of Hindu civilisation. Maloji brought a unit of 1000 cavalry, and infantry. He provided security to the people, and to traders, and in doing so grew increasingly wealthy. With his money, he dug wells, built lodges for travellers, fed the needy and renovated temples. His power and prestige grew, and so did the number of men serving under him. At the same time, Maloji still felt insulted by Jadhav Rao’s rejection, and began to press him to allow Jijabai and Shahji to marry. Jadhav Rao refused, but Maloji resorted to intense pressure, and invoked the Nizam’s mediation, forcing Jadhav Rao to comply. Jijabai and Shahji were married. Now it was Jadhav Rao’s turn to feel angered. Shahji grew up as a renowned general, while Jadhav Rao spent his life harassing and conspiring against Shahji. This deeply troubled Jijabai. She was also unhappy that both her father and her husband were serving under Muslim sultans, who she saw as marauders. Jijabai cared not for the riches that this service could bring; it was an undignified existence for Hindus in the land of Bharata. She was angered at being around men who spent their time bickering amongst themselves and could not protect their women, children, country and religion. She longed that her son may be an agent of change for the destiny of Bhartiya civilisation. With this inspiration, she studied the intricate political problems of the country, in the company of experienced politicians and diplomats. She could see people falling into poverty in the once rich land and could see the culture that she loved so much being disintegrated. If only a leader could be born who could unite the scattered Hindus. It was ordered that while she was pregnant, every comfort be conferred upon Jijabai. But she wished for none of it. Rather, she wanted to climb to the tops of forts on hills, wield swords, discuss political questions, put on armour and ride on horseback. It has been said in ancient Hindu shastras that the pregnant mother, by the psychological environment she provides does a tremendous amount to shape the child’s life for better or worse. In Vedic traditions, there are a series of sacraments and chants to be carried out as to optimise the child’s potentials. Jijabai infused in Shivaji a decisive and mighty psychological force, which was to flourish with grandeur and majesty throughout his life. Then, the most crushing news struck Jijabai like lightening. Jadhav Rao, her father, who had recently been readmitted to the service of the Nizam after defecting to the Moghuls, had been beheaded, together with her entire family. The exact reason for this was not known. The Nizam was purging influential Hindu leaders within his forces. Her husband too was in danger of meeting a similar fate, but he was shrewd and left the Nizam. In the time that followed, whole villages of Hindus were wiped out. A Hindu princess was carried away while bathing. At one time Jijabai herself was kidnapped to be used as a bargaining chip. Such were the times in which she lived. Jijabai’s fiery spirit was set ablaze by the slaughter of her family. Instead of frightening her, it just strengthened her resolve that an independent protector of the Hindus was an urgent necessity. She brought up Shivaji in the city of Pune, under the protection of Dadaji Kondev. Jijabai was one of the main administrators of the city. She was educated, able and wielded great authority (not adhering to the myth of the “oppressed Hindu woman of medieval India”). When they arrived, Pune was a city that had been consecutively ransacked by the Nizam, Adil Shah, and the Moghul forces. Each and every Hindu shrine had been smashed. But soon Pune flourished, with the help of Jijabai. She restored the shrines, and on many occasions settled disputes and meted out fair justice. 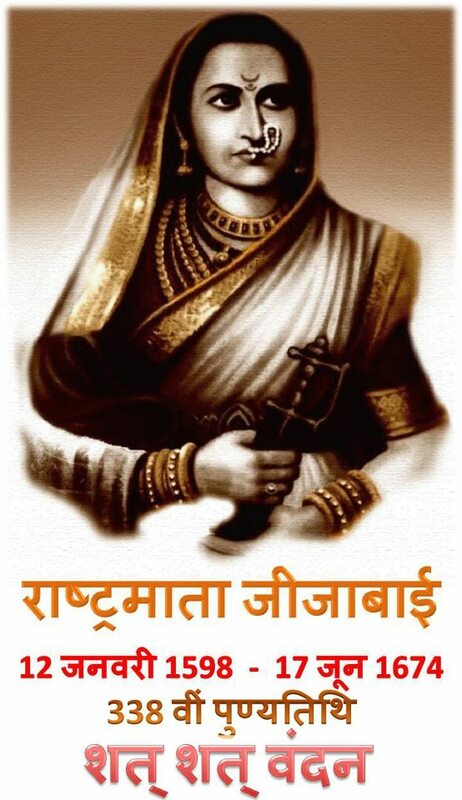 She was responsible for most of Shivaji’s education; having him learn about the Hindu shastras and arts of administration and weaponry, and the political situation in the land of Bharata. Shahji married a second wife, Tukabai, and spent most of his time with the latter. The effect this had on Jijabai, nobody can tell. Jijabai did not lose heart, and concerned herself as before, with administration, bringing up Shivaji and in long periods of prayer and meditation. Jijabai even set the scenes for social reforms in Hindu society. For example, on Jijabai’s advice, the Brahmins allowed a soldier named Balaji Nimbalkar to re-embrace Hinduism after converting to Islam under force of the sword. In those days, many people were opposed to such a move, believing such individuals were somehow polluted and no longer worthy to be Hindus. This is an attitude that to some extent persists today. But Jijabai could see that because Hindus created a system whereby people could leave the Hindu fold, but not enter it, Hindu society had been weakened. Jijabai impressed upon everybody the logic of this position. Furthermore, showing that she was genuine in her view, she arranged the marriage of Shivaji’s daughter Sakhubai to Balaji’s son. Shahji and Dadaji were worried and angered at Shivaji, when at the age of 16 he first captured a major fort. Jijabai on the other hand was overjoyed. When Afzal Khan, the renowned general of Bijapur came with a large army to crush Shivaji early in his career, Shivaji turned to his mother, who unlike others told him to face the danger resolutely. Shivaji’s army was much smaller by comparison, but by biding his time and using lightening guerrilla techniques, he worsted Afzal Khan’s army. When at a private meeting, Afzal Khan tried to kill Shivaji, it was Afzal Khan who ended up dead. This episode greatly increased Shivaji’s prestige. Jijabai treated Shivaji’s companions as her own sons, and was a source of courage and inspiration to them all. Tanaji Malasure is one such renowned example. He lost the fort of Simhagadh to an intense Moghul attack. She famously told him “If you free Simhagad from the enemies you will be like Shivaji’s younger brother to me.” Tanaji went forth, for what others advised to be an impossible mission. He succeeded in his mission of winning back the fort, but was slain in the process. Jijabai was watching from her castle in the distance all night. Although at first overjoyed at the news that the saffron flag had ascended on Simhagad, when she received the news of Tanaji’s death, she began to cry with pain and could not be consoled. On another occasion Baji Prabhu, a childhood friend of Shivaji, fought with great valour to save Shivaji’s life from imminent danger, and in doing so was slain. On hearing the news of Baji Prabhu’s death and Shivaji’s safety, Jijabai wept for the sacrifice of the brave Baji rather than feeling glad for the safety of her own son. 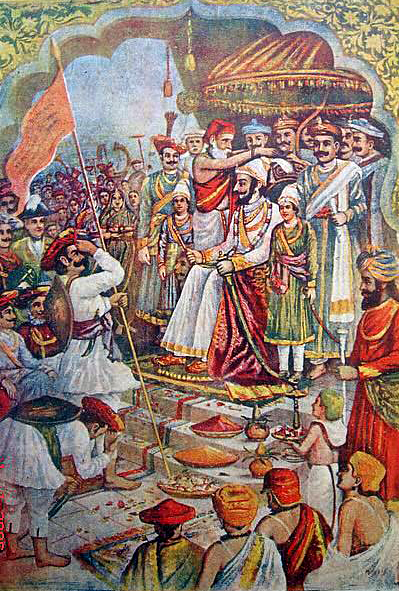 In 1674, Shivaji held a vast ceremony, declaring himself an independent ruler. Jijabai was present at the ceremony. What joy she must have felt attending the ceremony – everything she had lived for had finally bore fruit. 12 days later, Jijabai died. In her life Jijabai had to bare sorrow after sorrow, and did it bravely for her people and religion. She reflected the glory and strength of Mother Durga. We hope her life will always be remembered with reverence. HINDU RESISTANCE: Hindu civilisaton alone out of all the ancient civilisations of the world has survived in a continuity with its past, againt many determined attempts to exterminate it. This series of articles will focus on contributions of different persons and sections of Hindu society to this phenomenal achievement.